Bella Lago is the kind of log cabin on a remote wilderness lake that we have all dreamed about visiting. It is the perfect blend of rustic charm and modern convenience. This 2+ bedroom, 2 bath log home accommodates adult couples and their families for fishing, hiking, swimming, and kayaking adventures. And within 20 miles, you can dine out, golf, or shop in Lutsen or Grand Marais. There is a large screen porch to enjoy the outdoors while drinking your morning coffee and listening to the loons. There is a modern, well-equipped kitchen to create family meals and memories. The casual recreation room in the lower level offers an extensive movie library, games, and a great place for your kids to work on puzzles or play cards and board games. The log home is located on the shoreline of the western end of Pike Lake. Access to Pike Lake is via the Caribou Trail/County Road 4 outside of Lutsen. This is a comfortable and spacious log home with many modern conveniences suitable for creating wonderful family memories. Pike Lake is a large clear water lake with excellent fishing and peaceful canoeing, boating, and kayaking. For a really good time, bring your bikes and do some riding on the gravel roads and trails. Or head out on the lake to catch a few fish for your dinner. Note To Potential Guests: Many of our guests have commented on how neat, clean, and welcoming we keep Bella Lago. To prevent overuse, we don't rent the place intensively, e.g., we are not striving for full occupancy all year long. Hence we will only accept a limited number of bookings throughout the rental season and we only accept small groups (adult couples or families with young children) for weeklong/six-night stays during the peak summer months (July and August) and long weekends during the off-season (fall and spring). Normal check-in during peak season is on Sunday afternoons after 4p and check-out is on Saturday mornings before 10a. We have more flexibility for check-in and check-out times during the off-season. While Bella Lago is spacious, this is not the right place for large groups or people who are looking for a place to party hardy. Grew up on a farm in Wisconsin, attended the University of Wisconsin and the University of St. Thomas. Trained as a geologist and have worked in technical services and scientific sales. I have two kids, both young adults. We live in South Minneapolis. Decent distance from the Twin Cities, yet remote/secluded. Year-around access and relatively close to shopping, dining and services in Lutsen and Grand Marais. Perfect blend of rustic charm, solitude, comfort, and modern conveniences. Quiet place on a beautiful in-land lake. Fifteen miles to Lutsen, MN. Log home on an in-land lake. Pike Lake is a classic Canadian shield lake. Rocky shoreline, clear/cool water, surrounded by birch, fir, pine, maple and cedar trees. Most of Pike Lake is surrounded by State and Federal forest. Signal booster provided for cell phone service. I use a cell phone signal booster and get a strong signal (4 bars) from the towers at Lutsen. I access the internet via a mobile hotspot. Strong signal on Verizon and AT&T. There is a wood stove, but not for rental use due to insurance requirements. Large comfortable great room and for outdoor living a screen porch. One refrigerator on the main floor and another in the basement utility/laundry room. Complete kitchen with electric cooktop, oven, microwave, dishwasher, etc. Dining area seats 6 and the screened-in porch seats 6 as well. Lots of movies to watch - no satellite or broadcast channels available. Lots of puzzles and board games. Two kayaks, one canoe, and one small fishing boat. Guests need to be safety smart and wear life jackets. AlumaCraft fishing boat with oars available. Renters would need to provide a motor. Large screened porch (12 feet x 24 feet) with large table and a hammock. Lutsen National is 15 miles away. Two kayaks, a fishing boat (you provide the motor), and a canoe are on-site. Guests are responsible for their own safety and are to leave equipment ready for the next guests. 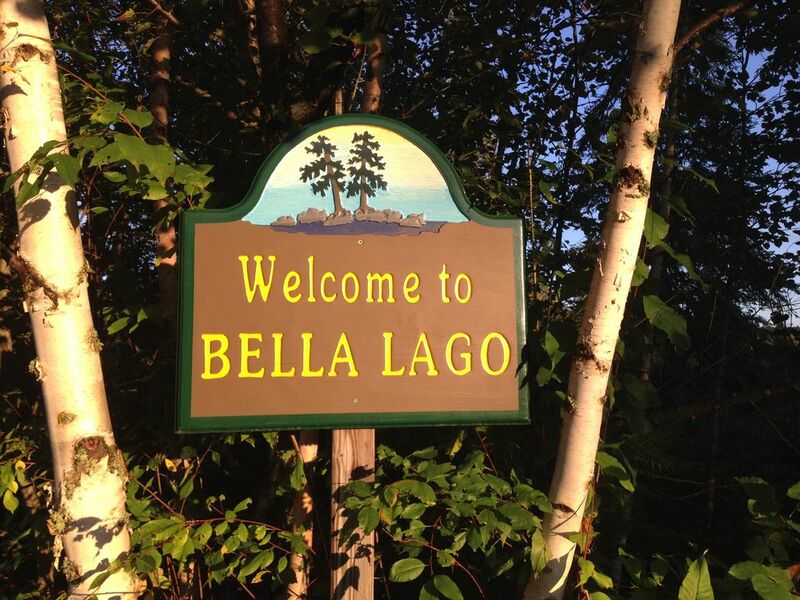 We had a great October weekend at Bella Lago. The weather was chilly, but the cabin was very cosy. Kids loved the loft and board games. Adults loved just sitting and contemplating the tranquility. We all loved smores and stargazing by the fire pit. It was a nice base for hiking in the local state parks. Things to note: the cabin is accessed by 10+ miles of unpaved roads. So it helps to have an appropriate vehicle, especially this late in the year (it snowed). Also, there is no wireless internet, just a cell phone booster, with no signal for T-mobile. This was a plus for us, as we really wanted to get away from it all! This was more than a cabin--a lovely roomy log house that is really comfortable. It was perfect for 2 couples. The kitchen was well-stocked, including with spices and canned food, with extra stored in the basement. The huge screened in porch was fabulous. In early September we could often have breakfast, lunch and happy hour out there (too cool by dinner time). Two of us could not get cell service there, but being off the grid was welcome. The boat dock, with 2 kayaks, a canoe, and a fishing boat was wonderful--we went down there to watch loons and common mergansers and often saw bald eagles. We even sighted a wolf on the road to the cabin! Another great surprise was that there were no mosquitoes or black flies, as we had feared. It was 40 minutes to Grand Marais, which has plenty of restaurants, cafes and the World's Best Donuts, so you need to plan accordingly as far as groceries, but we enjoyed the feeling of really being off the beaten path. One caution: the path from the house to the lake is not far but rather steep, and trees block most of the view of the lake from inside the house (might be different in winter). If you have mobility challenges, it would be hard to really enjoy the lake. But otherwise, it's a short walk and we went to the lake many times a day. Also, the second bathroom is in the basement down steep stairs, and not on the main floor where the other living space is. Overall, it was a beautiful house and setting and we would definitely want to return here someday. Note that the path to the lake is a graded drive, is mowed throughout the summer, and is used to put the dock in in the spring and take it out in the fall. It is not a rough trail or goat path. We (4 adults) stayed in this beautiful cabin on September 1-4. The cabin is very clean and has everything you need to have a comfortable stay in the woods. The beds are comfortable and the living space has a lot of room. The screened in porch is fabulous to sit in and enjoy the sounds of the forest or to relax in the hammock with a good book. The drive to Grand Marias is about 40-45 minutes if you want to venture out and the store in Lutsen is really close once you get back to the highway. The owner was very responsive and easy to work with if need be. There is absolutely nothing negative about this place. The lake was a quick walk downhill and while we did not take out any of the boats, they are available and look to be in good shape. We would definitely rent again. Greg, thank you again for sharing your vacation home with us. We had a great time at Bella Lago! The place was clean, the lake it amazing, and we had everything we needed for a great week. Our favorite spot was the large screened in porch! Having access to kayaks and canoes were so nice, the only pitfall is we were hoping to see the turtles hatch but they never appeared! We would definitely consider staying here again. We had a wonderful time staying here. The cabin was very clean which made it easy to relax right off the bat. We enjoyed being able to walk down to the lake and the proximity to great hiking in the different state parks and surrounding area. Private and secluded-Just what we were looking for. We especially enjoyed the big screened in front porch. We fished from kayaks and rowboat -caught Northerns and SM Bass. Greg was very accomodating and prompt in answering texts/e-mails. Private log home in a wilderness setting which feels very remote, yet you are only 20 minutes from Lutsen. Pike Lake is a large body of water with excellent fishing. The log home is comfortable and very accommodating with a library of movies, games, and books for your enjoyment. You have access to two kayaks, a fishing boat (you provide the motor), and a canoe for water adventures and there's a outdoor fire pit for telling campfire stories and roasting marshmallows. Other Activities: Hiking and mountain biking trails within a mile. Golf: Superior National Championship Golf Course is an experience for the avid golfer. This course has 27 holes and offers spectacular scenery as well as a great golfing experience. Shopping & Dining: Grand Marais is a great destination for shopping and dining. Excellent restaurants (some are seasonal), a new brew pub, world famous doughnuts, arts & crafts, outdoor apparel, books, and groceries. Plan to spend time in Grand Marais. Summer rate of $1350/week (assumes six nights/arrive Sunday evening, depart Saturday morning) for 2 adults. Additional guests are $25 per person per night. Pets welcome with a $50/pet fee for the week. Check-in on Sunday afternoons after 4p, Checkout on Saturday mornings by or before 10a. We ask that guests do some cleaning prior to departure. Please take garbage with you when you depart as we do not have waste collection service. Maps, instructions and a checklist will be provided to guests prior to their arrival. Pet fee of $50/pet per stay. Pets are to be kept under control. Clean-up required and never leave your pet in the cabin alone. No glass at the lake shore or in the fire pit. Please do not burn plastic, paper, bottles, cans or trash in the fire pit.